Lacquer Lockdown: Hot Off The Stamping Press: Bunny Nails HD-C & HD-D Halloween Plates! 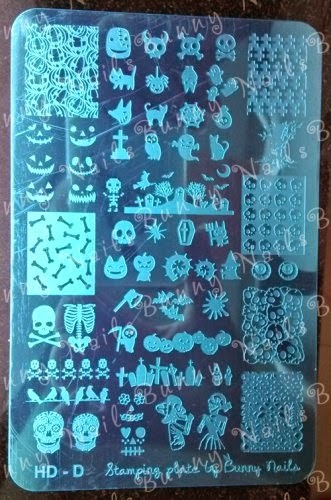 Hot Off The Stamping Press: Bunny Nails HD-C & HD-D Halloween Plates! There are so many HOT plates coming out right now it's really ridiculous! Bundle Monster just realeased their new Make Your Own Set, Red Angel has a 2013 set, and waaay too many more to count. I need to do a weekend round-up post just to keep up. However today I've got some AMAZING ones! Let me tell you I have been a fan of Bunny Nails since waay back in the day essentially when I discovered her Angry Birds plate which was the first of its kind. She has been slowly putting out holiday plates over the last 2 years. This ridiculously cool HD small plates that were all Halloween themed and largely stole my heart. Then she started with her larger HD Holiday plate series which encompassed most if not all of the major holidays including the 4th of July, Easter, New Years, Christmas and so on. 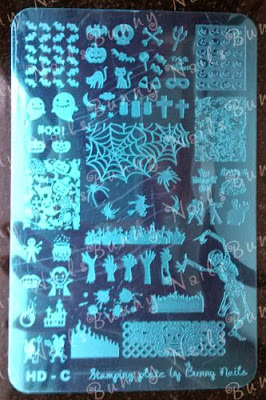 Well she's done it again releasing two more large HD plates entirely devoted to Halloween and Dios de Muertos! The plates measure roughly 14.5 x 9.5cm while the full size images themselves measure approximately 2 x 2.5cm. I love Bunny Nails plates!! I must rush to get them both!! You won't regret it! Mine arrived yesterday they are spectacular! Btw thank you so much for always leaving comments you are so kind!!!! !